Welcome to the Mid-Week Blues-Buster Flash Fiction Challenge, Week 46! This week’s song prompt comes all the way from Italy… Italia’s favorite doomsters, Lacuna Coil. This week’s Judge is the guru of Last Krystallos Publishing… Lisa Shambrook! The challenge begins the moment you read this post and runs through 9PM PACIFIC TIME on Friday January 31. Thanks to everyone that took part this week. Though small in number it was a select group of tales. Every one of them had elements to commend them, things that I have learnt from and will try to incorporate into my own writing. I hope that I can do it as well as you did. As an aside, whilst I loved the song from an artist who was completely new to me, I found, as I know others did, that it did not speak to me as a writing prompt. Still. inspiration is like lightning, if it hit us all the same there would be a lot of dead bodies lying around after every storm. Aftermath by Inkofthesoul I liked the overall tone of this piece, the protagonist’s reflective voice came through well. I also liked some of the images. Somehow, however, I felt that this was an unresolved tale that did not tie together all the elements. The passage ‘I had never felt the need to bargain with death, or plead to the fates, or believe in a God. But I would have dealt with, begged to, or believed in anything, if it would have saved her life.’ was particularly striking for me, having a well balanced rhythm that read beautifully. Fangs versus Sideburns by Bullish The dialogue in this tale is its strength. The main character’s voice is really distinct and, for me, bespeaks a mixture of power, callousness, arrogance and grudging humour that made me want to know more about him and his situation. The kid, however has the best line, showing that small details often make a piece far more resonant. Responding to the question “How are you going to stop me?” with “It’s not how. It’s why….” made him truly three dimensional; more than just a walk on part in another’s larger drama. Second Runner Up Runaway by The Rogue Tinker A great tale. It combines a strongly written action sequence in the foreground with an intriguing back story for the protagonist in the background. You also managed to make the absent Thomas a real character in the story. Again, the inclusion of small details adds richness to the structure. I felt that your last line wrapped up the story perfectly and brought it together. Strong echoes of the song. Runner Up Untitled by Mark Ethridge I could really see and feel the location, despite it barely being described. Shelly’s presence and actions fleshed it (and her) out in a way that worked well. Her weight of back story hung over the tale like a stormcloud with flashes of action and reflection illuminating the piece like lightning. (Incidentally I imagined the soundtrack to the early part of the club scene as the music that plays in Walter Hill’s film when The Warriors are in the Lizzies’ clubhouse. But that’s just me!) Your use of repetition in the tale is almost poetic as a device but adds a momentum that is powerful, particularly when added to the cadence that very short sentences gives it. I felt that the way the release of tension at the flat was described was at odds with the very present, tactile immediacy of the opening passage and, though beautifully written, jarred for me in this way. This Week’s Winner Untitled by drmagoo The shortest story this week packed the biggest punch for me. I loved and admired almost everything about this little tale, from the evocative first line to the brutal, abrupt four word ending. The voice tells you more and more about the protagonist as you read. The multi dimensional, contradictory aspects of this man’s character is laid out in a beautifully written, subtle way. I found myself trying to cast this person in a filmed version, so real had he become in such a short passage. As I have said elsewhere, small details are essential in building reality, and these abound in this piece. It also ties tight to the harshness of the opening lyric of the song whilst standing completely on its own feet. This is possibly my favourite flash fiction of the year so far. Welcome to the Mid-Week Blues-Buster Flash Fiction Challenge, Week 45! This week’s song prompt is a great tune by Grace Potter & the Nocturnals. This weeks Judge is author & Minion extraordinaire… Nick Johns. The challenge opens the moment you read this post and closes at 9PM PACIFIC TIME on Friday January 25th. First off, love the song. I can always count on the music that Jeff chooses for his contest to be awesome. Nil Lara has now been added to my Slacker for continued listening. Once again Jeff has further expanded my musical palate. Now for the entries: What a collection – a lot of sadness, misery, love-lost, love-worn, hope, and a few surprises in between. This was a difficult decision, the stories were all so good, but a contest is a contest and only one can truly win, yes? So here are my picks. 3rd Place “Skin and Teeth” by Bullish After hearing the prompt song, a story about werewolves was not expected in the slightest, but loved it all the same, and still fits with the mood of the song. I enjoyed the dry wit of the narrator of the story, how he just seemed to roll with the punches. Now I want to know what happened after he was bitten. Really enjoyed this spin on the prompt. 2nd Place “Crushed Petals” by Jeff Hollar What a story … reads like a letter to a former lover, or the thoughts of someone on what he or she would say to their former lover if given the opportunity. One sentence really stuck out: “Loving you too much to the exclusion of living for myself was wrong.” This should be something that EVERYONE should go by. And I think we can all relate to going completely bananas about someone, to the point that we let ourselves get submersed, at least for a time. Great job. And the big wiiiiiiiinner is….. Drum roll please…. 1st Place “Muse” by Beth Avery I loved loved loved the wording of this story … the tornado/water analogy was beautiful … and gave you a new way to visualize how one-sided the relationship was. I pictured the whole thing in my mind and it really struck a chord. Plus, it had a creative way of utilizing the prompt in a literal way, if that makes sense. All in all, great job everyone. You made it very difficult to decide. And thanks to Jeff for allowing me to judge this week. Welcome to the Mid-Week Blues-Buster Flash Fiction Challenge, Week 44! This week’s Judge is the founder and chief cook & bottle washer of Daily Picspiration… Miranda Gammella! The challenge opens the moment you read this post and runs through 9PM PACIFIC TIME on Friday January 17th. Wow! You guys blew me away with the variety of stories you came up with for this beautiful song. There was something to love and enjoy about every one of them. Narrowing it down to three was not easy! That said, after bolstering myself with a strong cup of coffee, I put on my thinking hat and got down to business. 3rd = Michelle Fox – I so enjoyed that these weren’t lovers in a traditional sense. Made the weight of their brief interaction powerful. Loved that closing line: “keeping her heartbeat and his as one.” For me, that summed up the essence of the song in seven words. 2nd = TorToe – This piece so captured the sense of confusion that comes with the loss of a child – the disbelief, the sense of being disconnected from everything and everyone, even those who love you most and who are in the thick of it with you. I could see this playing out in my reader’s eye as the song echoed in the background. 1st = Mark Ethridge – All along the way, this story seemed so well suited to the music and lyrics, and then in those final lines it shifted (pun intended) and WOW. “I’d always known my heart would be torn apart … I just never imagined she’d literally rip it out and eat it.” I love that imagery juxtaposed against the heartfelt and hopeful ballad. This week’s prompt comes from singer-songwriter… Jose Gonzalez. The song is his gorgeous cover of, “Heartbeats”, by The Knife. This week’s Judge is our own Mortuary Mama… the fantastic Ruth Long! The challenge opens the moment you read this post and runs through 9PM PACIFIC TIME on Friday January 10th. 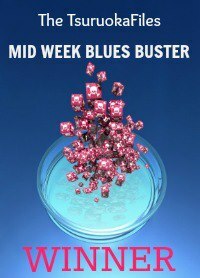 Week 42 of the Mid-Week Blues-Buster is in the books. Hey everybody! Jeff asked you to flash me…and flash you did! I love seeing how one song can inspire different people to write different things. 3rd place – Bryan (@BryanTheTinker) Your piece was fun! I originally thought it was going to be a little boy playing out in the dirt, but instead was surprised. And the ending was great…of course it worked! Kudos, Bryan! 2nd place – Danielle Young (@y3111er) A great entry as part of the Mid-Week Blues-Buster…I’m a sucker for romantics…and super powers…I loved it! I hope you let us see more from you in future weeks! Miranda Kate (@PurpleQueenNL)! Your piece was brilliant! You had me from word one. Wondering what exactly was going to be happening…and the payout was just right. Wait…that makes me sounds weird, doesn’t it? Ha! Good job, Miranda! Thanks everyone for playing this week and letting me read all your fantastic stories! Thanks to all of our writers, readers, & to Judge Stephanie!